My Mum and Dad have left for home and, after the Closing Ceremony, it has really sunk in that this amazing period of my life is almost over. It was really strange and I have no idea how this happened but I was the very first athlete (of any Nation) to walk out into the stadium after the flag bearers had come in. The actual first! A few people text me about this as they were watching their TVs at home. The beginning of the Closing Ceremony was really good but it dragged on a bit too long, in my opinion. I liked the fact that someone with a sense of humour managed to persuade the Sochi Organising Committee to allow them to display a "malfunction" of the 5th Olympic ring - everyone thought this was very funny. 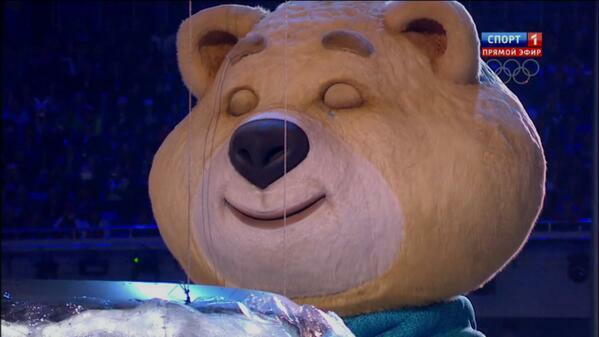 My favourite and, at the same time, saddest part of the ceremony was when the bear extinguished the flame and cried! And of course there were fireworks. I have become used to a spectacular firework display every evening since February 7th, I don't know how I'll cope without them - I'll have to see if my Dad will let off a few rockets for me in the garden when I get home! We stayed for a little while at the after-party whch was held in the stadium immediately after the public had left. After we left the Fisht Stadium for the last time, we were all starving so we headed over to the Coastal Olympic Village (home of the free McDonalds) for supper. I had a burger, fries, a drink and a McFlurry and I thought this was quite indulgent. But Conor and Seamus had 3 burgers each together with 2 portions of chicken nuggets, a wrap, fries, milk shakes and McFlurries - Sean made them eat the lot before they could leave the table! The amount of empty cartons on our table was unbelievable. But they weren't alone, the place was packed with athletes who normally have to be fairly sensible at mealtimes, taking full advantage of McDonalds' hospitality! Some of the aftermath from our dinner! I could not believe that we were all given medals as well as certificates for having participated in the Olympics! It is lovely and quite heavy. I don't know if they always do this at Olympic Games or if this was just something special for Sochi. In the morning I have to finish packing before we check in our luggage here at the Village. I'll definitely miss this sort of thing when I'm not travelling as part of an Olympic team and I have to start handling my own bags again!